Image © DC Comics. Written by G. Willow Wilson, art by Cary Nord and Mick Gray, colors by Romulo Fajardo Jr., letters by Pat Brosseau, cover by Terry & Rachel Dodson. Ares, God of War, has recently escaped imprisonment on the Amazon home Themyscira, and is fomenting war in eastern Europe (I think). 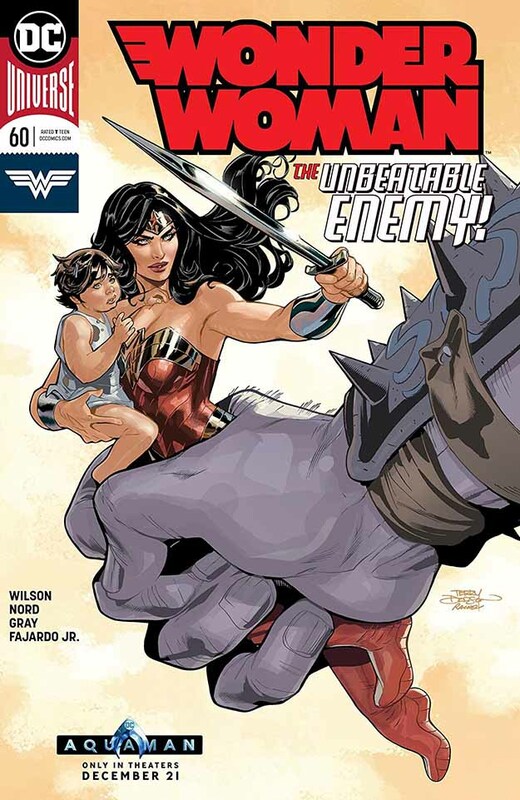 Wonder Woman confronts him, and they battle, but she suggests they should be working together. Ares seems willing to listen to this idea, or is he? Diana has her hands full trying to stop the fighting on the ground, and is still searching for her friend Steve Trevor, who has been captured by one side or the other. We find out who’s behind that this time, and it’s another familiar figure from Olympus. This entry was posted in Comics, Reviews on January 15, 2019 by Todd.